2019 PDF Calendars with Australia and Popular Holidays. Calendars are otherwise blank and designed for easy printing. They are ideal for use as a calendar planner. 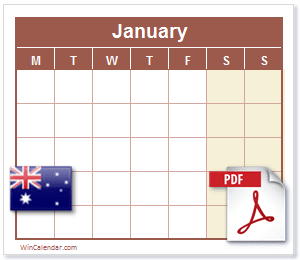 Australia calendars are also available as editable Excel spreadsheet calendar and Word document Calendars. 2019 Calendar with Australia Holidays. For calendar with holidays for the next year see:2020 Calendar with Australia Holidays in Acrobat PDF format, 2021 Calendar with Australia Holidays in Acrobat PDF format.